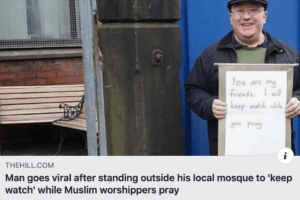 MAN GOES VIRAL AFTER STANDING OUTSIDE LOCAL MOSQUE TO “KEEP WATCH” WHILE MUSLIMS WORSHIP. “There are two ways you can respond to an attack like this [in Christchurch] — you can respond with fear or you can respond with friendship,” he said. 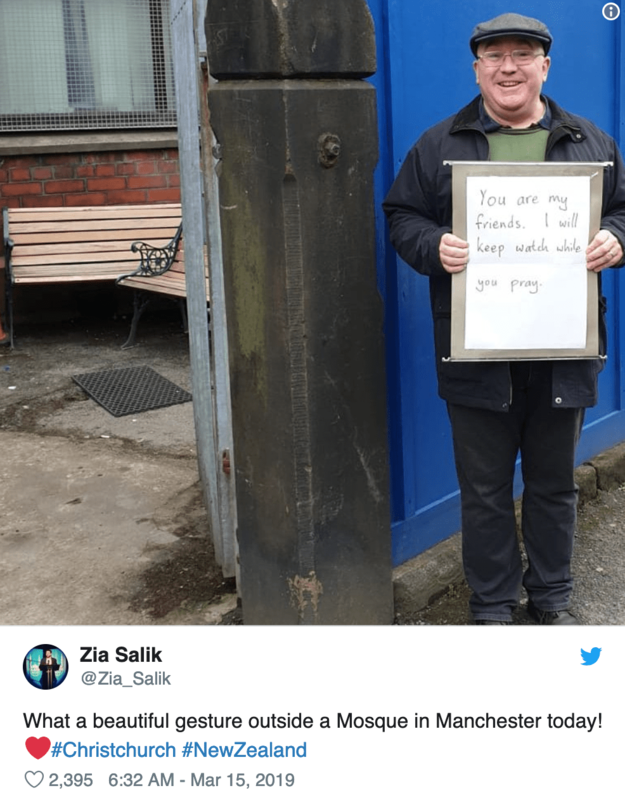 A man from England is receiving praise online after standing outside his local mosque holding a sign saying he would “keep watch” while Muslim worshippers prayed after a terror attack that targeted two mosques in Christchurch, New Zealand, on Friday left 50 people dead. Graystone told the BBC on Saturday that Muslims attending the mosque “beamed” after seeing his gesture. “There are two ways you can respond to an attack like this — you can respond with fear or you can respond with friendship,” he said. “As people walked up, you could see in their eyes that they were looking at somebody standing outside their mosque, thinking ‘Oh no, is this some kind of protest or whatever?’” he said. “And then when they saw the message saying ‘You are my friend,’ their faces broke and they beamed and smiled,” he continued. Graystone, who runs a Christian charity, told the outlet that he was surprised by the overwhelming amount of support he received on social media for the act of kindness. “I hadn’t intended for anybody other than the people at Medina Mosque to know about this,” he told the BBC. “But I guess there are little things that lots of people can do to just express friendship rather than fear with Muslim friends, and neighbours and colleagues — so I just took one little action,” he added.